The 'Lego House' man gives fans at the Royal Albert Hall a taste of his forthcoming new album. Ed Sheeran treated fans at his Teenage Cancer Trust show in London last night (24th March) to a performance of new song 'Take It Back Now'. The star was performing a rare headline show back in the UK as he took to the stage at the Royal Albert Hall. The new track sees Ed rapping at lightning speed that makes 'You Need Me, I Don't Need You' look like a pensioner running for the bus. 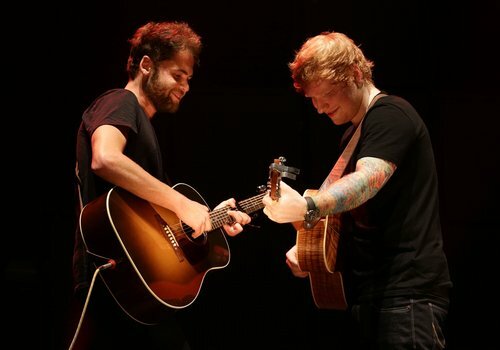 He was also joined on stage by Passenger later in the gig. Ed's previously performed new tracks from his forthcoming second album during sold out shows at Madison Square Garden and this is further insight into what to expect from the follow up to '+'. The singer also recently posted the date 7/4/14 – hinting at a possible announcement for new music. Meanwhile, Ed is among the nominees for Best Twitter Bromance alongside Scooter Braun.